Las clausulas condicionales son usadas para expresar los posibles resultados en el futuro cuando un evento depende de otro. Es, en esencia, una condición que al cumplirse (o no) provoca que otro evento se desencadene. If I get a raise at my work, I will buy a new TV. De la misma forma, la cláusula condicional puede colocarse después de la cláusula principal, en este caso no se pone la "coma" en medio para separar las oraciones. I will buy a new TV if I get a raise at my work. 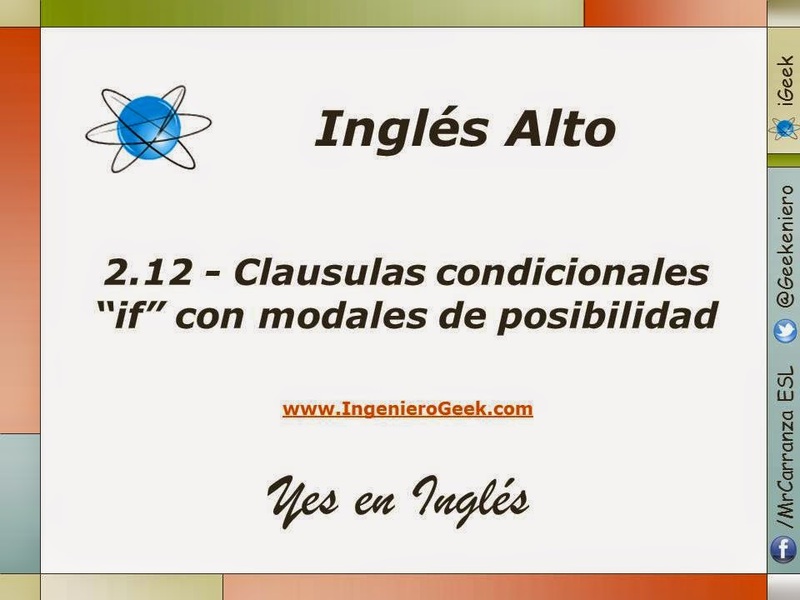 En este tipo de condicionales se hace uso del "presente simple" en la cláusula condicional y para la cláusula principal puede usarse "will", "may" o "might" + la forma base del verbo. A este condicional también se le llama de tipo I o primer condicional. Nota: También pueden usarse las oraciones en forma negativa del verbo ya sea en una o ambas clausulas. Observe este caso en las siguientes oraciones. If I don't study for this test, I might not pass the course. If she doesn't cook the dinner, we will buy something to eat. Las reglas implícitas para cuando se habla de una tercera persona (He, She, It) deben seguirse en la cláusula condicional dado que es una oración en presente simple. A continuación algunos ejemplos que brindan más claridad en los usos de las clausulas condicionales combinadas con verbos modales de posibilidad. 1.- If I don't go to work today, I will lose the punctuality bonus. 2.- She will go on vacation next year if she saves enough money this month. 3.- If you start eating junk food again, you might gain some weight. 4.- Students might not pay attention if you present boring classes. 5.- If Gaby goes to the party, she may have a good time. 6.- Mr. Wilson may not buy the house if he doesn't receive his loan. 7.- If the pizza doesn't arrive on time, we will get it free. 8.- The computer might not work well if it has a virus. 9.- If Vanesa rents an apartment, she might throw parties more often. 10.- Diana and I will not travel soon if we don't have free time. Siempre y cuando la cláusula condicional esté en tiempo "presente simple" y la cláusula principal en futuro con verbo modal, entonces se está hablando del primer condicional. Existen diferentes tipos de condicionales y, por supuesto, la gramática es distinta. Para estos tipos de condicionales ya habrá cabida en el siguiente curso: Yes en Ingles nivel avanzado. 1.-If I have free time this weekend, I will go to my parents house. 2.-If I buy a new car, I might not go on vacation to the beach. 3.-If I get a new job, I will have better income. 4.-If I move to europe, I might know the city of paris. 5.-If I go to the movies tonight, I will see a horror movie. 1.-If I have free time this weekend, I will go to the beach. 2.-If I buy a new car, I might go to travel . 3.-If I get a new job, I will be better . 4.-If I move to europe, I might know the Rome Italy. 5.-If I go to the movies tonight, I will see the Martial art. 1.- If I have free time this weekend, I might go to the Father Island whith my family. 2.- If I buy a new car, I might drive to visit my parents every weekends. 3.- If I get a new job, I will buy a new house. 4.- If I move to Europe, I won't see my family very often. 5,- If I go to the movies tonight, I will not be on time in my home for dinner. If I buy a new car,I will pull travel next week. If I get a new yob,I might call you tomorrow. If I move to europe,I might los my jobe. If go to the movies tonight,might we speak to yuo for a momento. 5- if I go to the movie tonight, I will see Minions movie. If I have free time this weekend, I will go to the soccer game. If I buy a new car, i might drive to my work. If I get a new job, I will buy a new car. Andres Lopez Yañez 6 IM Sabatino UT. 1.-If I have free time this weekend, I might play soccer. 2.-If I buy a new car, I might go to the beach. 3.-If I get a new job, I will buy a new car. 4.-If I move to europe, I might visit spain. 5.-If I go to the movies tonight, I might see an action movie. If I have free time this weekend, I will work in my house. If I buy a new car, I may not go to Cancun. If I get a new job, I will buy one mansion. If I move to Europe, I may get a new work. If I go to the movies tonight, I will not my homework. Arturo Cruz Torres. 6IM Sabatino. If i have free time this weekend, i might play videogames. If i buy a new car, i might go to the mall. If i get a new job, i will buy a new house. If i move to Europe, i will get a new job. If i go to the movies tonight, i might see an horror movie. Eulalio Nava Cruz 6°IM Sabatino. If I have free time this weekend, I might go to buy to Mcallen. If I buy a new car, I will go to visit at my parents. If I get a new job, I might help at pay the house. If I move to Europe, I will need learn another language. If I go to the movies tonight, I might not get up early. EUGENIO HERNANDEZ CRUZ 6 IM SABATINO.